“For too many on the Left, Jewish suffering does not touch them the way Muslim suffering or gay suffering or black suffering touches them,” wrote Stephen Daisley in 2015 on the eve of Jeremy Corbyn’s election as Labour leader. And it was beginning to look as though the Bishops – rather like Corbyn – cared about every minority except Jews. Being mainly prophets of the Left, they are always swift to speak out on behalf of the oppressed LGBT and vulnerable Muslim communities. They proclaim love to Gay Pride to “tackle prejudice and promote awareness”; and leap to bash Boris when he transgresses the bounds of burqa intolerance. But the Jews? Well, it seemed they were being singled out for a particular episcopal disregard; the matter of their oppression avoided even as it was revealed that 40 per cent of them would “seriously consider” leaving the UK if Corbyn were to become Prime Minister. You can imagine what the Bishops would be tweeting if Pink News carried a story that 40 per cent of gays were considering emigrating to avoid a homophobic Tory/DUP political pact. Or if 40 per cent of Muslims were worried about an Islamophobic Boris premiership. But 40 per cent of Jews? Well, it’s almost as if the Bishops lauded the vote of confidence from the 60 per cent who would stay: not one single bishop uttered a word about Labour antisemitism until yesterday, when Bishop Pete of Willesden let Corbyn have both barrels. A swift check on Google and a broad survey of Bishop Pete’s Twitter feed and Facebook life established that he hadn’t been clear about Labour antisemitism at all on social media, but that doesn’t negate the possibility (indeed, likelihood) that his conversations with friends and acquaintances were robust in their denunciation. And this may be true of a good many bishops, but if you are publicly defending Muslims and gays against oppression while reserving the anguish of Jews to private cups of tea, it isn’t much of a witness to them of Christ’s love and compassion, is it? No bishops commented on this. 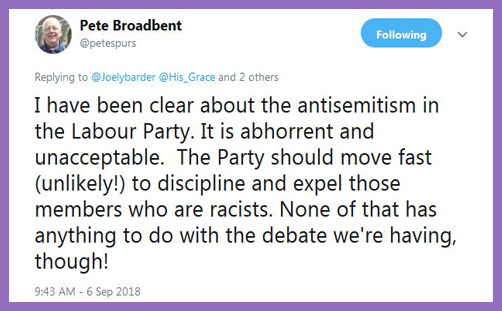 No bishops commented on this, either – until yesterday, when Bishop Pete Broadbent (a fervent Labour supporter) let it be known that he wants Labour antisemtism dealt with robustly and for the racists to be swiftly expelled. Significantly, he acknowledged the distinct unlikelihood of this, principally because Labour’s ascendant antisemitism appears to have become acceptable (if not desirable), often expressed in the delegitimisation of the State of Israel or fraternal greetings to Hezbollah or Hamas, who are committed to the destruction of Israel and a ‘final solution’ for dealing with the Jews in Palestine. Christians may differ on the eschatological place of Israel and its significance in God’s plan of salvation. But on antisemitism there can be no equivocation. If the Bishops publicy condemn homophobes and homophobia; and if they express disgust at Islamophobes and Islamophobia, they must also publicy denounce antisemites and antisemitism in order “tackle prejudice and promote awareness”. If they don’t, they must ask themselves why gays and Muslims are more worthy of a Church of England defence than Jews, and then perhaps meditate on what this distinction might be termed.